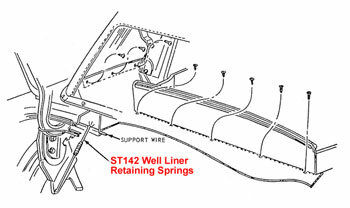 These Conv Top Well Liner Springs hold the well liner open by attaching to the rod that fits in the listing of the well liner. The other end of the spring attaches to the mount in the trunk that the trunk hinge attaches to. These springs were originally installed on all 65-66 Mustang Convertibles. Please note that they are sold as a pair to do one car.